Welcome back. So on my 1st day of the Oryx hunt, I was fortunate enough to spot and stalk a bull near to 500 lbs. My shot was ranged at 225 yards and under the watchful eye of the man upstairs I was able to make a perfect shot through the shoulder bone, all four heart valves and the lungs then the bullet came to rest in the meaty tissue of the far side rib cage. I was certain to extract and keep the bullet as I wanted put to the test Hornady’s claim of 90% or better weight retention. 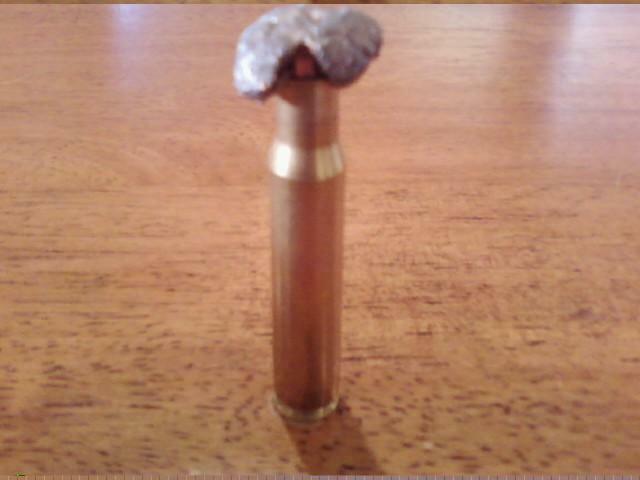 Amazingly, the bullet remained in tact with a near perfect mushroom and most of the jacketing. As expected, no polymer tip though. After a thorough cleaning, I pulled out and calibrated my scale. Remember that this bullet weighed exactly 165-grains prior to loading. I proceeded to weigh the bullet and came up with 154.44 grains. That equates to a whopping 93.6% weight retention. Looks like that clearly beats their claim of 90% weight retention. Considering the dense bone that this bullet traveled through and shattered, to reach the vitals, yet remained at better than 93% of it’s original weight, I am convinced that this is the manufacturer of which I will continue to purchase from for my reloading components. My next Oryx hunt, I plan on testing Hornady’s new GMX [Gilding Metal Expanding] solid’s in my Savage 300 WIN MAG. Feel free to share your stories with me by leaving comments! An honest testimony of “Hornady InterBond®” bullets. Let me open by saying that I am an avid reloader and have tried many brands of bullets and wish to share an experience I’ve had with Hornady InterBond® bullets. 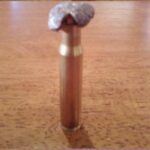 For purposes of this blog, I loaded a .308 caliber, 165-grain Interbond® bullet atop a Winchester 30-06 cartridge, WLR primer and using 55.625 grains of IMR 4007 SSC powder. This would be my first ever hunt for Oryx on the White Sands Missile Range in southern New Mexico. An Oryx is a Gemsbok, from the Kalahari region of Africa, which is not indigenous to New Mexico but was brought here in “1969, when the New Mexico Game and Fish Department released Oryx as part of its exotic animal introduction program on the White Sands Missile Range“. As it stands, the Oryx is at the top of the food chain here in the Tularosa Basin, and with exception to the occasional Mountain Lion, has no natural predators to regulate population growth. As luck would have it, the hunting community has been asked to assist with population growth and this exotic, rather majestic animal, is now available to harvest through the New Mexico hunting lottery system. What makes this animal unique to other North American Big Game is the method of correct “shot placement” used to cleanly and quickly retire this difficult to knock-down beast of 400 – 500 pounds. To ensure a clean ethical harvest, one must shoot “through” the very thick shoulder bone to access the vitals. What this means for bullet manufacturers is to develop a bullet that can travel at higher velocities, without the jacket separating too drastically from the solid inner, yet still provide expansion and maintain near 100% weight retention. In my humble opinion, Hornady has achieved this with their Interbond® line of bullets. Come back in a couple days for Part II of “An honest testimony of “Hornady InterBond®” bullets”.